The Vermont State Police is a full-service law-enforcement agency that provides primary law-enforcement services to about 200 towns, 90 percent of the land mass, and 50 percent of the population in Vermont. Our Emergency Communication Dispatchers answer roughly 89 percent of all E-911 calls made in Vermont. In addition, the specialized resources of the Vermont State Police support our local, county and federal partners in times of need. The 332 sworn members and 64 emergency dispatchers and civilian support staff who work for the Vermont State Police make a difference in the safety of Vermonters and visitors, every day. 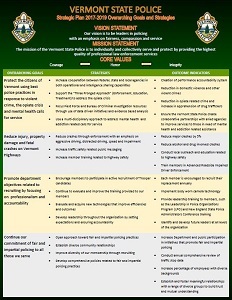 The Vermont State Police is committed to excellence, including our mission, vision, and core values. 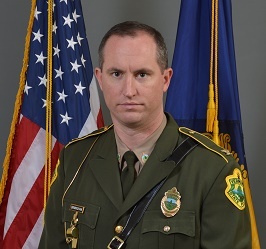 Col. Matthew Birmingham is the director of the Vermont State Police. He can be reached by email and through the Vermont State Police Headquarters in Waterbury at 802-244-7345. The Field Force Division, commanded by Maj. John Merrigan, consists of 10 field stations throughout Vermont. The Criminal Division, commanded by Maj. Dan Trudeau, investigates major crimes including homicides, drug cases and other specialized investigations. The Support Services Division, commanded by Maj. Ingrid Jonas, oversees recruitment, training, technology, fair & impartial policing, public information and Internal Affairs. Maj. Jonas also serves as the Department's Executive Officer. 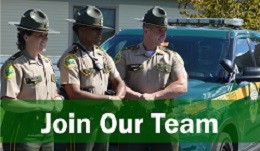 The mission of the Vermont State Police is to individually and collectively serve and protect by providing the highest quality of professional law-enforcement services. Our vision is to be leaders in policing with an emphasis on fairness, compassion and service. Troopers will have the inner strength to face danger and conflict while making difficult decisions under stress and pressure. Troopers will maintain a value system based upon truth and honor. Troopers will always maintain a character of high standards in accordance with the Vermont State Police Rules and Regulations and do what is legally, ethically and morally right. The Vermont State Police shoulder patch is a modification of the Seal of Vermont and the State's Coat of Arms originally designed by Ira Allen of Green Mountain Boys fame. The mountain peaks are Camels Hump and Mount Mansfield as viewed from a point opposite Burlington. The Vermont State Police shoulder patch was adopted in 1947 by Major General Merritt A. Edson, the first Commissioner. Click here for information on patch requests.